In 1859 a group of wealthy Pittsburghers founded the Allegheny Telescope Association and opened the observatory in 1861 to club members. It was well equipped with the third largest telescope in the world when it opened. Club membership dropped as interests changed and less than 10 years later the money for this venture was running out. It was then donated to the local University (Western University of Pennsylvania, now the University of Pittsburgh). It became known as the Allegheny Observatory and the University hired Samuel Pierpont Langley for their first director. As the Professor of Astronomy and Physics, Dr Langley expanded the facility to add classrooms, darkrooms, and dormitories, and conducted research on sunspots. In 1869 Dr Langley began to essentially sell time. Langley used astronomical measurements to accurately determine the time. He constructed a system with a telegraph connected to a master clock that would send out the exact time twice a day. The railroad industry needed precise times to run the trains, so they became his biggest customer. He used the money earned with this subscription service to fund the facility and his research. This sculpture honors this particular aspect of Samuel Pierpont Langley’s work. The illuminated blue and yellow lights represent old railroad switchlamps. On top of the sculpture is a rotating clock minute hand with its shape based on our three rivers. The sculpture is constructed of Corten Steel (the same type used for the USS Building, which actually develops a protective layer of rust), and stainless steel, with the minute hand being made out of aluminum. This sculpture is at the boundary with the Chateau neighborhood and the Northshore and right on the Three Rivers Heritage Trail. It is part of the North Shore Riverfront Park (commissioned by the Sports and Exhibition Authority for this specific location) and part of a public art initiative designed to reconnect people with our rivers. 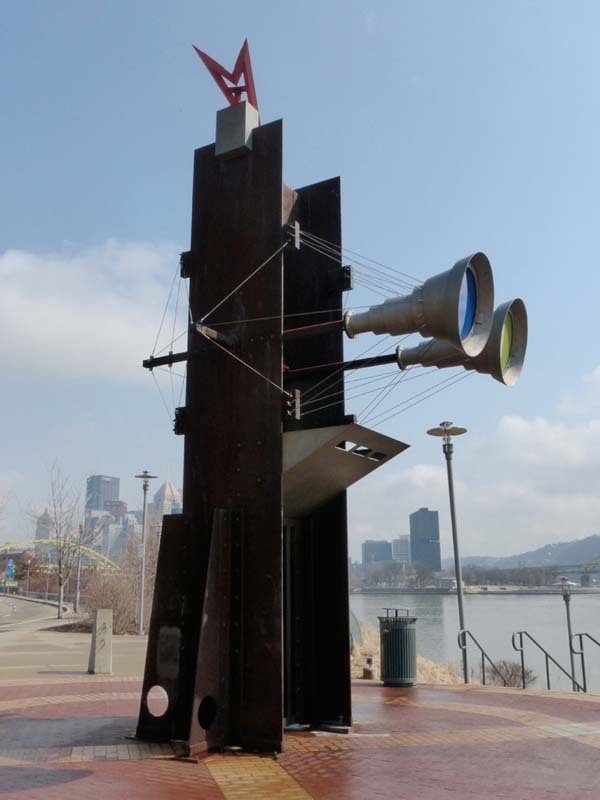 In Mr Fischer’ artist statement he says it celebrates the act of looking out over the river. 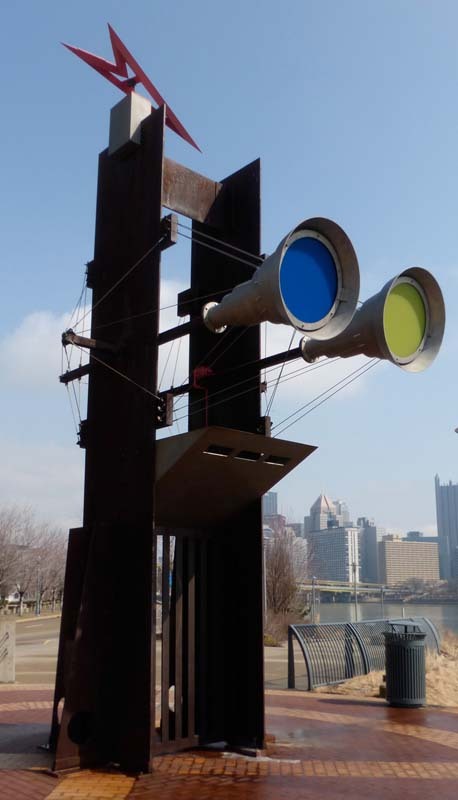 The work is a response to the industrial history of Pittsburgh while simultaneously appearing timeless and looking forward .